While it may not look exactly like an Olympic meet to home viewers, Michael Phelps promised the race “was awesome"
The world is standing by, waiting for the greatest Olympic swimmer of all time to finally meet his match — the great white shark. Ahead of a 100-meter race that kicks off Discovery Channel’s beloved Shark Week, Phelps visited “The Tonight Show” Thursday to reveal some details of the anticipated showdown. Though great whites may haunt the imaginations of other land dwellers, Phelps seemed excited by his close encounters with the ocean predators, explaining that he had been fascinated with sharks from a young age. And Phelp's well-informed love for the animals certainly showed while the 32-year-old chatted with "Tonight" host Jimmy Fallon. Charlize Theron and Jimmy Fallon take turns using the dance move generator to make up random dances on the spot, like the "Slap the Giraffe" and the "Double Kayak." “Oh, is that it?” Fallon joked. Nevertheless, Discovery has promised a dramatic event. The network dubbed the face-off: “The battle for ocean supremacy,” with Phelps taking on the shark off the coast of South Africa. Yes, gold went up against white in the open ocean instead of in, say, adjoining pool lanes as Phelps is accustomed to. The shark was timed swimming for 100 meters in one area, while Phelps was timed swimming separately in another area with safety divers around him. The individual set ups were about more than just safety though, Phelps explained to Fallon, highlighting the challenges of competing against a wild animal. Sharks likely wouldn’t swim all 100 meters at full speed, which can top out at 15 miles per hour in short bursts, according to National Geographic. However, they have been reported to hit bursts of 25 or even 35 miles per hour, as Phelps noted. Jimmy Fallon reads the best viewer tweets with the hashtag #MyFamilyIsWeird. To compare, Phelps said he clocks in about 6 miles per hour in a normal race. Also, great whites rarely swim in straight paths. Phelps said Discovery had to do its best to record the animal for an accurate and fair race, though the technical details have been kept under wraps before the air date. To further level the playing field, Phelps explained that he donned an especially buoyant wetsuit, one that allowed him to float more easily in the water. The athlete also strapped a man-made mono-fin to his feet. “So I could swim like a shark,” he said. Phelps kept coy with Fallon about just how much faster he propelled through the water with the fin. However, he told USA Today last week that he likely hit 8 to 10 miles per hour — impressive for a mere human but still slower than what his opponent is capable of. 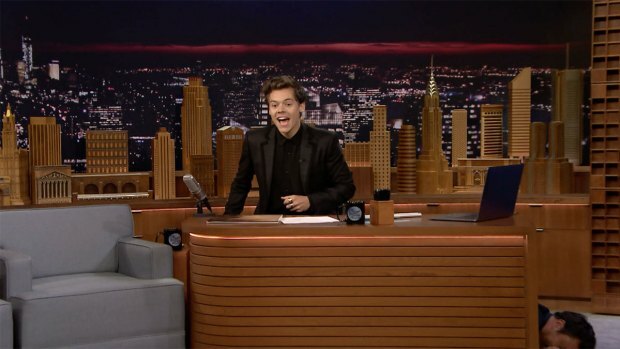 Jimmy Fallon has Harry Styles make a special wish, before the singer takes over the host's desk. Can a trained, 28-medal Olympian measure up to an evolved ocean predator? Only time will tell. “Phelps Vs. Shark” airs Sunday, July 23, at 8 p.m. ET on Discovery.